by Youth Ocean Advocate Thuy L.
My grandfather was a collector of odd things and a lover of secondhand treasures. One of his very first gifts to my family when we came to the U.S. was a Big Mouth Billy Bass. I remember seeing this plastic fish mounted on the living room wall of my house. As an oblivious six year old, I asked my parents why they would want to display such an ugly thing. My grandfather answered by pressing the magic button on the plaque. Big Mouth Billy Bass started flapping his tail and singing! I became so entranced by this funky toy and I constantly nagged my parents to let him sing. When they weren’t home, I would sneak him off the wall like the devious child I was and let him watch the Little Mermaid with me. When my grandfather passed away 8 years ago, I inherited a lot of his treasures. He had this golden bejeweled fish brooch that I would wear whenever I needed luck. I’ve always felt safe and connected to him when I was outdoors, with the sun on my back, or the clouds pouring rain. It wasn’t hard to have these outdoor opportunities because living in Washington, you are bound to visit a salmon hatchery at some point. I went to the Issaquah Salmon Hatchery on multiple field trips and each time, I am amazed at how these wonderful fish, depending on the species, are able to lay around 2,000 to 7,000 eggs! My 5th grade class was fortunate enough to see the lifecycle of salmon from egg to parr when we grew them. As the fish obsessed kid, I always volunteered to clean the tank. When they were big enough, we took them down to Seward Park to release them back into the wild. I remember holding this live, but sadly non-singing fish in my hand, and walking knee deep into the water to let it go. I don’t know how I was able to understand this at a young age, but I knew that it was everyone’s job to care for these animals. You may have never had a plastic fish for a pet or held a live salmon in your hands, but your contributions to the health of animals and their habitats are important nonetheless. 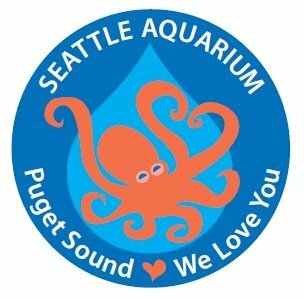 As an advocate for the health of the ocean and it’s many creatures, I hope you all get to know the neighbors you share Puget Sound and the Earth with, and how to protect them. Your first step could be choosing to eat sustainably sourced seafood (http://www.seafoodwatch.org/ocean-issues/wild-seafood) which helps preserve marine ecosystems and keeps populations abundant. I also encourage you to see the wonders of wildlife for yourself by taking advantage of the local centers for learning, like the Seattle Aquarium or even, a salmon hatchery.